Liev Schreiber Connection: Top Ten Tuesdays: Beyond the "Meet Cute"
Top Ten Tuesdays: Beyond the "Meet Cute"
touches, only writes to, keeps little photographs of." Rom Coms get a bum wrap. It's true. They're lighthearted and go for the gags, which often gives the poignant moments a saccharine edge. Why does this diminish the whole endeavour for some? It's actually the most true-to-life form of cinema. Okay, so no one has ever hopped on a horse and chased down a mugger for me. But even Bukowski had a few laughs and got laid every once in awhile. And any chance to see Liev being the good guy is great by me. All I'm saying is, a film doesn't have to be Last Tango in Paris for me to give it serious consideration. And that's what today is: My Top Ten Favourite Kate & Leopold Moments. 1) Love that Stuart, even before the opening credit montage, is already displaying a wonderful sense of humour with his laughter at the talk of "the world's most perfect erection." Liev's looking around as if to say "Are you people hearing this?" Kind of sets the tone for Stuart's wry, tongue-in-cheek sense of humour. Liev is great right out of the gate. 2) Liev in period clothing. Oh yeah. 3) Liev's Stuart the visionary would be a pleasure to know but in all seriousness it could be a tough gig for a girlfriend. Too bad Meg Ryan's Kate couldn't just decide to be the ladder climbing breadwinner and lighten up. If she'd been willing to fund his projects, he could have done so much. Ironic that she winds up finding true love through his knowledge. She resents him until he owes him everything. 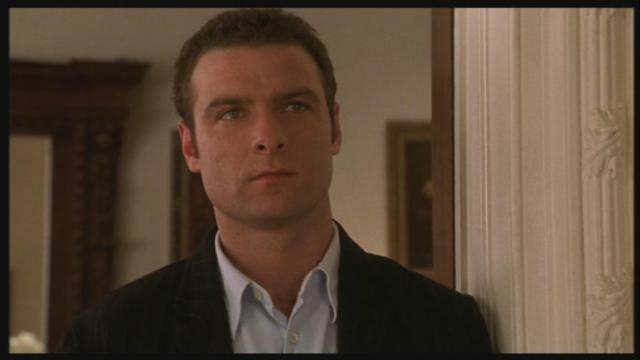 4) Liev's Stuart is an open soul. His kindness and protectiveness with all those he cares about, including new the modern day Leopold, is a little window to his depths. I love the fact that Kate initially suspects him of having brought home a man for some carnal enjoyment. You get the sense that she would put nothing past Stuart and yet Liev makes him easy to like. 5) There's slapstick side to Liev here that we rarely get to see. Falling, slipping, a maze of crutches and body casts, reaching for a phone... Liev's a modern day Jerry Lewis in this role. 6) The Rainbows and Dogs speech is without a doubt one of the cutest Liev performances I've ever seen. My hope is that you'll all go out and buy this film, but if you're on the fence check this clip out on youtube. You will not be disappointed. 7) Liev propelling Stuart into action is a wonderful thing. Once Stuart's accepted Kate's destiny, the deal is done and we get to see how he brings it all together. Stuart is under a time crunch so while he must be sensitive to other people's feelings, he also sees the reason why he has to move forward. Liev's keen sense or urgency here is the exact mix that's needed. 8) As Kate's dream comes true and she's made a partner in the firm, she stands before her peers and comes to the realization that all she's worked for is empty without Leopold. Liev's Stuart comes to understand the old her just as she is bourgeoining into the new her. Then he catches up again. And you see it all in the glint of an eye (as captured in the photo above). It's a smile from the eyes only - I don't know how else to say that. Wouldn't it be nice if when a relationship ended, the two parties could honestly look at each other with respect and say it's nobody's fault, we just weren't right? 9) Stuart and Charlie have a brotherly connection that makes them work well as a team trying to get Kate into the life she we wants. I thought Liev was really touching in these scenes. 10) Liev's Stuart, in the final moments with Kate, knows her better than anyone and helps her to leap. He's confident that the metaphoric net will just appear. And of course he's right. Kate knows she owes him everything. The tenderness of his encourageing 'Go, it's okay" was almost the best part of the whole movie, I think. SOB Liev was poetic and beautiful. That is my favourite scene also! It's soooo sad and heartwarming all at the same time! He he I'm just doing my part to resurrect old movies while we wait for new ones to appear.